As of this moment – and we knew this going in, but – LeBron James is now a made man in Cleveland, having finally realized Teflon Bron status. If he were to go out and kill a man in cold blood, plenty of brooms would be out to sweep it under the rug. To Clevelanders, the prodigal son has earned his fatted calf, with a group of tarnished golden boys as the slaughter. When ESPN later verified that he was the first player in history ever to do the above, we became able to unequivocally say we’ve never seen anybody do what LeBron did during this series. Neither Jordan, nor Kobe, nor Russell nor anybody else led from the front the way King James did. What LeBron did over the course of the Finals, but especially over the course of the last three games, was a weird stylistic combination of the last decade or so of professional basketball. He wasn’t gloriously efficient in a machinist way, but he was good enough, and that combined with his proclivity for hero ball under pressure paid immense dividends for the Cavaliers down the stretch, when he knew he wouldn’t lose, couldn’t lose. As Rodger Sherman at SBNation pointed out, LeBron did the impossible, which has become routine to him. Countless texts arrived writing the Cavs off as long as they couldn’t hit a three; sooner or later, it was presumed, the Warriors would go on a signature run, choking the life out of Cleveland once more. Indeed, the Cavaliers made only 6 of their 25 three-point attempts, including a Shumpert four-point play and Irving’s final straw. The Warriors made 15 of their 41, yet it wasn’t enough. For all his shortcomings early in the series, Kevin Love did his part in Game 7, pitching in a serviceable 9 points and 14 rebounds and being the only Cav other than James who looked like he gave a damn in the first quarter. Irving, of course, hit the shot that Cleveland children will have on posters for generations to come. But James is the reason they were even relevant, and is now the reason Cleveland is the happiest sports city in America. He capped his unbelievable Finals with, naturally, a 27-11-10 triple-double which ended up being the most important in a year full of them. The chasedown blocks, of which there were only three in Game 7 when it felt like there were twenty, had me laughing out loud, clutching at my chest for fear of James knocking it clear out of my body. He wasn’t blameless throughout the series – he knows the games within the game better than anyone, to his occasional PR and reputation detriment – but when it mattered most, he simply did what he had to do, and then some. There was no way he wasn’t going to make this happen. 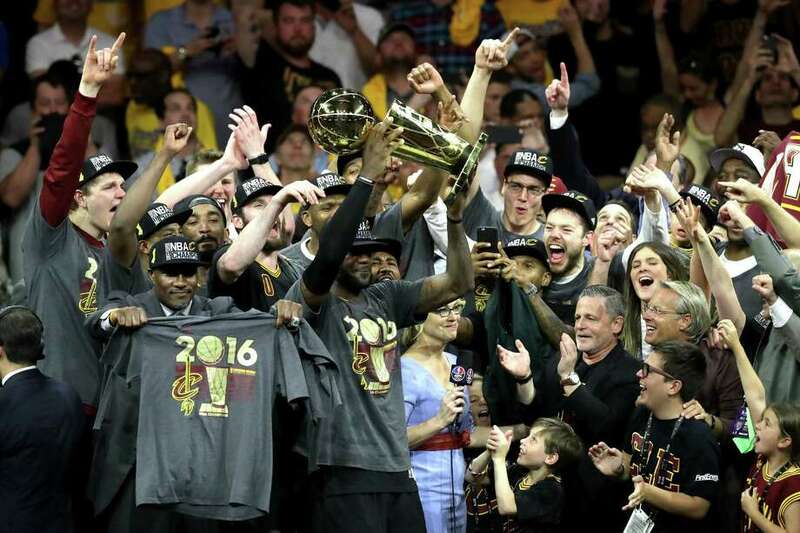 The hangover could, understandably and somewhat justifiably, last forever if Clevelanders wanted it to. As Adrian Wojnarowski pointed out at The Vertical last week, a Cavs win would mean unlimited flexibility for James with regard to northeast Ohio without fear of backlash. Like Dirk Nowitzki with Dallas in 2011, LeBron has delivered on his promise, so if he wants to go form a super team in Los Angeles, or Miami, or Utah (? ), or New York (NOPE), best of luck to him. LeBron hate Twitter is dead, and don’t let anyone tell you otherwise. Anybody left questioning him at this point is either a troll, doesn’t watch basketball or just doesn’t enjoy greatness at its greatest. What happens from here – the draft, free agency, all the other machinations that make the NBA a year-round event – will be fun and miserable, tedious and electric, but ultimately, we come here for what happens on the hardwood during the 48 or more minutes of playing time. Right now, and for all time, the King stay the King. °One note that my oldest brother first pointed out to me: the teams in every major North American sport with the most wins – these Warriors, the 2007 New England Patriots, the 2001 Seattle Mariners and 1906 Chicago Cubs, and the 1996 Detroit Red Wings – have now all failed to deliver a title. Read into that what you will, or nothing at all. It’s #justfacts over here.